Though its name may be inspired by the high flying world of aviation, Honda's Pilot SUV is a decidedly down-to-earth vehicle. And though it may come off as a tad bland, it's really just a straightforward, no nonsense imagining of the eight passenger SUV niche. The Pilot began life as kind of a "down market" Acura MDX, which is a pretty good place to start. It's a bit square compared to the MDX, in looks and demeanor, but in my week as a Honda Pilot pilot it worked just fine and transported my family and our stuff beautifully. And it'll undoubtedly continue to deliver no fuss performance for many years. 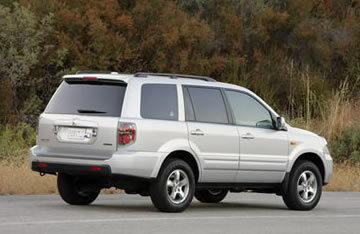 Honda Pilots can be had in either two wheel drive (2WD) or the four wheel drive (4WD) configuration my test unit wore. Both versions feature a 3.5 liter 24-Valve single overhead cam VTEC V6 engine, though the 2WD's also has Honda's Variable Cylinder Management (VCM) system which deactivates three of the engine's cylinders, to save fuel, during cruising and deceleration. The 4WD version doesn't offer VCM. The 4WD Pilot's output is rated at 244 horsepower @ 5600 rpm and 240 lb-ft. of torque @ 4500 rpm; the 2WD model has the same power and torque, but the power reaches its maximum at 5750 rpm. Not a big deal either way, and under normal circumstances you should find the oomph to be more than adequate as long as you don't plan to haul big slabs of concrete or pull a fully furnished double wide mobile home behind you. The transmission in both versions is a five speed automatic that, at least in my test unit, has its selector mounted on the steering column. I found that a tad hard to get used to in my short time with the vehicle; on more than one occasion I turned on the windshield wipers when I was trying to shift gears. On the other hand, sticking the selector on the column frees up space on the center console for storage in addition to the relatively small glove compartment and the abundance of other bins and boxes located around the interior. The overall driving feel's pretty good. Pilots feature an independent suspension front and rear and it keeps the vehicle planted nicely and makes it feel relatively nimble. The vehicle's overall boxiness may help contribute to an inclination for the Pilot to not slip through the wind with the utmost of grace, though. Shortly after I picked up my sample I was driving along a major highway during some typically ugly foothills wind gusts and, while it never felt as if we were going to end up in Oz, the vehicle did experience quite a bit of buffeting. But the drive-by-wire throttle works well and feels good, as do the variable power-assisted rack and pinion steering and power-assisted 4-wheel disc brakes (with ABS). The 4WD Pilot's stability is helped by Honda's VTM-4 (Variable Torque Management 4-Wheel Drive) system, which delivers torque to all four wheels as needed, though it's biased toward the front. Honda says it's for excellent dry-road vehicle dynamics as well as outstanding control in wet, icy and snow conditions - and it also meant I experienced no torque steer to speak of. A "lock" feature maximizes traction for very slippery or "stuck" conditions, though I didn't need it during my test. Honda says its "Safety for Everyone" initiative means all Pilots come with Vehicle Stability Assist (VSA), (a.k.a. electronic stability control), brake assist, and a bevy of air bags including dual-stage, dual-threshold driver's and front passenger's SRS airbags, front side airbags with passenger-side Occupant Position Detection System and side-curtain airbags for all three rows. A tire pressure monitoring system is also standard and I got no ugly surprises from it - probably because the outside temperature wasn't cold enough to freeze a monkey's bum during my time in the Pilot's seat: in my experience, these monitors become worse than useless when it gets really cold outside. 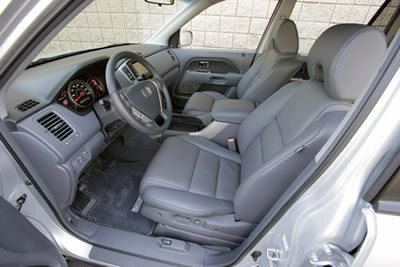 The Pilot's interior is straightforward and efficient, if a tad Spartan in appearance. standard on all Pilots are air conditioning, a tilt (but not telescoping) steering wheel, power windows and door locks, cruise control, keyless entry, 60/40 split "three passenger" second row seat and a 60/40 split "three passenger" third row seat. My tester also had a reasonably sized sunroof, though it didn't feature one touch open/close capability. The front seats are comfortable for longer hauls; my tester's driver's seat featured power adjustment, though the passenger seat didn't. The middle row reclines somewhat and is easy enough to move out of the way for third row access. The driving position is good, with a straightforward (there's that word again!) instrument panel and easy to reach controls, though the signal light and windshield wiper/washer controls seemed a bit light duty for a medium duty "truck" (as if they were lifted from a Fit or something) and the audio and HVAC systems' LCD displays nearly disappear when you wear polarized sunglasses. But the outside rear view mirrors are of a good size for rearward visibility and, even better, are mounted fairly low outside so they don't block your view of pedestrians, etc. I was a tad nonplussed to discover that I couldn't reach down between the driver's seat and the center console (when, rather klutzily, I dropped the keys down there), but by sliding the seat all the way back I could get at them. It made me wish for driver's seat memory, though! I wouldn't want to spend a lot of quality time cramming three people into either of the rear rows, especially the rearmost one (which also takes up a lot of usable storage space when it isn't folded down), but on the whole they're not too bad for shorter trips. And the floor's flat back there, which is nice for the person stuck in the middle. Neither "rear" row folds down completely flat for storage, but it's close enough for most needs. We hauled a dresser and some other stuff in the Pilot and it was plenty roomy for such needs. Getting in and out of the first two rows is easy. The vehicle isn't so high that you need a pogo stick to reach it (fortunately! ); I could slide my bum nearly straight onto the driver's seat and I aspire to being five feet seven inches on good days. The inside door handles for both front rows are nicely designed and placed, and the doors have comfortable armrests with well placed controls. My test unit also came with the optional ceiling-mounted DVD Entertainment System, with a nine inch LCD screen, removable remote control and three sets of wireless headphones. I sat in the middle row and watched some of The Incredibles and was very impressed with the sound quality, though the video quality is unremarkable. The audio system is easy to use and sounds okay, though it's nothing to write home about compared to some. 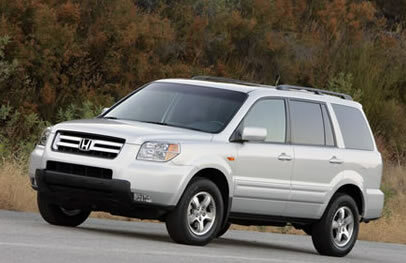 Honda says the Pilot has achieved the U.S. government's highest five star crash safety rating for both frontal and side impacts, as well as the Insurance Institute for Highway Safety (IIHS) blessing as a "Top Safety Pick - 2007." 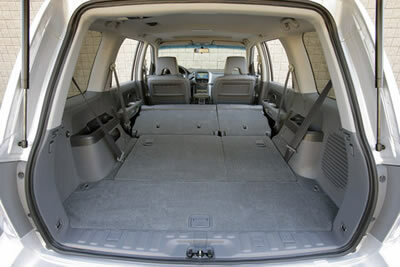 This is probably one of the reasons the company continues to "Pile-ot" up the sales of this nice, mid-sized SUV. 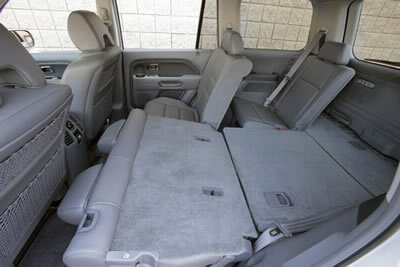 The Honda Pilot starts at $27,595 U.S./$36,820 Canadian.